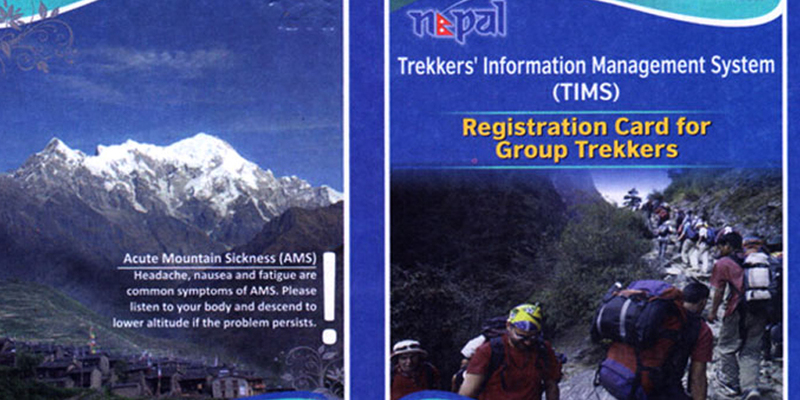 Trekking Agencies Association of Nepal (TAAN) and Nepal Tourism Board (NTB) implementation the Trekkers' Information Management System (TIMS permit) effective from 1st January 2008 with the objective of maintaining the date base of trekkers and discouraging illegal operation in Nepal trekking industries of Nepal. As per the provision, all trekkers should have the valid TIMS Permit by through government registered Nepal trekking Agency. TIMS permit required for regular trekking trails of Nepal such as Annapurna region trekking, Everest region trekking , Langtang trekking but if trekkers take peak climbing permit in relevant area not required TIMS permit as well as restricted trails doesn’t required TIMS permit. TIMS permit obtain from Government registered Nepal trekking companies who is associate with Nepal trekking Agencies association of Nepal and compulsion used trekking staff from the agency. TAAN informed that the TIMS mechanism would be help secure for the trekkers and only authorized Nepal trekking agents as it discourages independent trekking operator, leaders that were robbing the trekking agents off their business. On the other hand , without Government registered trekking company of Nepal, to participate in the trekking is more hazards/risky cause of the individual trekking and Illegal trekking operator can't provide any kind of insurance for their staff while their staff/Trekking crews and if clients get problem during their trekking in Nepal Himalaya with out government Registered trekking unable to send the Helicopter for Rescue if you follow with Government registered trekking company might be more comfortable and safety journeys in Himalayas . For the effective distribution of TIMS certificates, TAAN will use the offices of all its member agents as TIMS Counter. TAAN intends to use the collected amount for rescue, tourism awareness, publicity and administrative expenses and it will help us to ascertain the number of trekkers in a particular trekking route.